Please dial 911 for emergency situations. 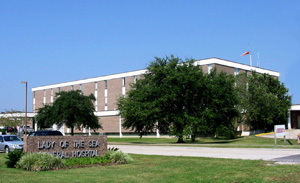 Lady of the Sea's Emergency Department is available 24 hours a day, 7 days a week. Our staff is well prepared to handle emergencies from car accidents to unexplainable illnesses, stabilizing patients and comforting loved ones in stressful times. You will be asked to give your name to the clerk at the registration desk and to have a seat in the lobby. A nurse will call you into our Triage room to interview you concerning your chief complaint and to complete a brief assessment which may or may not include vital signs. Depending on the severity of your illness or injury, the triage nurse will either bring you directly to an examination room or allow you to complete the registration process with the clerk. 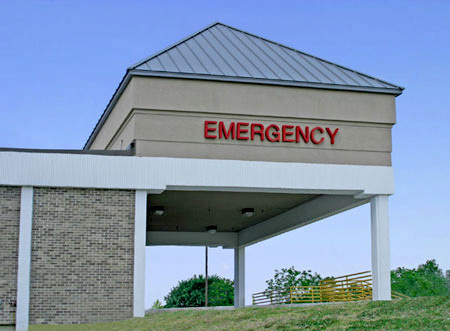 Patients presenting to the Emergency Department are not always triaged and evaluated on a "first come, first serve" basis, but according to established Emergency Department guidelines. There are some instances such as ambulance arrivals, patients receiving extensive work ups or non-availability of beds which may delay being placed in an exam room immediately after triage and registration. In such instances, the wait time could range from one to several hours. The need for blood to support patient care is an on-going reality and challenge for community hospitals across south Louisiana. Blood donations can be given every eight weeks, and some acceptance criteria have been changed. If you are waiting and feel that your condition has worsened, please inform the registration clerk. The triage nurse will be notified so that a reassessment can be completed. We understand that your time is valuable, and we ask for your patience. Providing emergency care and treatment for all our patients is important to us and we will work efficiently and safely to get you examined as soon as possible. If you are waiting to be seen by the doctor, please do not eat or drink anything before checking with the nurse. Also, please check with the nurse before using the restroom in case a specimen is needed. Please have your current list of medications and allergies ready for the doctor and nurse to review. Once you are placed in the examination room, you may be asked to undress and put on a hospital gown. For your privacy and the privacy of the other patients, the door to your exam room will be kept closed. You will be evaluated by the Emergency Department physician who determines the plan of care/treatment based upon your symptoms and his physical findings. The treatment could range from receiving a prescription and being discharged to receiving blood work, x-rays, IV's and other diagnostic tests which may take at least a minimal of 3 hours to complete. We will keep you updated regularly regarding the progress of your care. At the discretion of the staff, two visitors may accompany each patient in an exam room. Snacks and drinks are not allowed in the examination rooms. In order to protect the confidentiality of the other patients, we ask that patients and visitors refrain from gathering at the nurse's station or in the hallway. In an effort to provide a safe environment for our patients and to decrease the risk of falls, we ask that patients use their call bell to request help from staff especially if you are feeling weak or dizzy. Infants and children should never be left alone in the exam room or unattended on the stretchers. After the results of your x-rays and lab tests have been received and reviewed by the emergency room physician, he will decide whether you can be discharged to home, admitted to the hospital, or transferred to another facility. If you are to be discharged to home, the physician will write home care and follow up instructions for you. These instructions will be reinforced by the nurse and you will be given the opportunity to ask questions regarding any concerns before signing your discharge instructions. If you are admitted to the hospital, the emergency department must talk with your family doctor or his designee about your diagnosis and treatment plans. The Emergency Department staff will call to obtain a bed for you and you will be taken to your room as soon as possible. Sometimes delays may occur such as change of shift reports and unavailable beds on the nursing units. In such instances, you will remain in the Emergency Department. Please be assured that the staff is working as hard as possible to get you to a more comfortable room and that all your care needs will be followed by the Emergency Department staff. We realize that communication is a vital part of treatment, and being ill or scared already alters your ability to listen and comprend information about your health care. So we ask that you please refrain from answering or using a cell phone when a physician or nurse is communicating with you. We want to provide you with excellent care. If you have any concerns regarding the care you received, please feel free to call Mrs. Marion Touro in Patient Relations at 985-632-6401. According to the Louisiana Nurse Practice Act and guidelines from the American College of Emergency Physicians, registered nurses and ED physicians are not allowed to give any medical advice over the telephone. The caller may or may not accurately perceive or evaluate the urgency of the situation or condition that prompted the call. "Many people still call the ER to ask medical questions, such as how much medication to administer, or to explain a medical condition and ask for advice," says Buffy Lafont, RN, Emergency Department Manager at Lady of the Sea Hospital. "We really want to help, but we cannot discuss any type of medical condition over the phone. Our advice to the public is that if you have a medical condition that occurs during normal clinic hours, call your local family physician's office. If the medical condition is life-threatening or if it occurs when the clinics are closed, come into the emergency room for treatment." She further suggests the use of an established telephone triage program for medical advice or a 24 hour pharmacy for certain medication dosages. Some of these services are available by medical insurance companies. Consult your insurance carrier or your insurance plan profile for more information. We realize that patients and families may be upset or frightened by their illness or injury when presenting to the Emergency Department. We hope that this information will help you to understand our processes, and encourage you to partner with us so we can provide safe quality care to our community. If you are experiencing difficulty breathing or severe shortness of breath.